Established in 1969, Peter Harrington is a leading dealership in the rare and antique books market. With a stock of fine books from 15th to 20th-century literature, the firm has sourced an array of outstanding items including one of 100 copies of James Joyce’s Ulysses on Dutch paper and Shakespeare’s first folio (1623). Pom Harrington, who joined the firm in 1994, now runs operations from the company’s flagship store in Fulham Road, Chelsea. 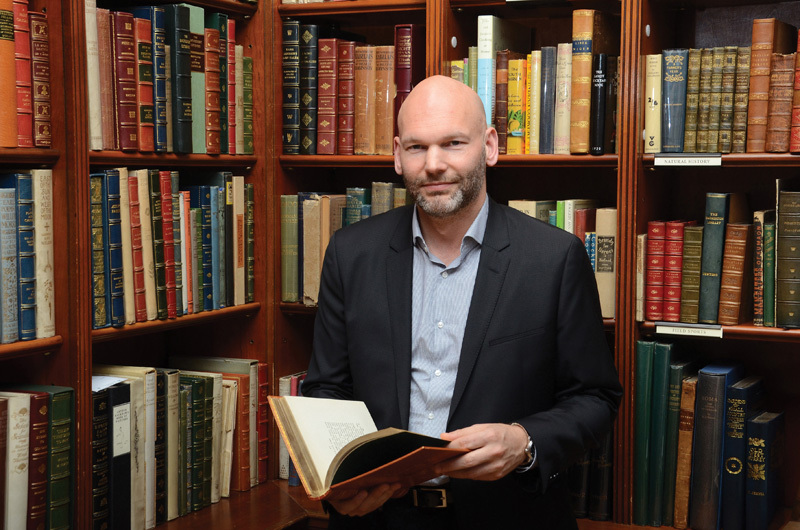 In an Arts & Collectionsexclusive, the rare book dealer provides his top tips and industry insights on the world of rare book collecting and investment. Q. What makes a blue-chip investment, in terms of rare and antique books? Pom Harrington: If you look at the last decade or two, certain things have just taken off. Economic books, for example, and also popular science works like Charles Darwin Origin of Species, these things really have flown. They transcend mere rare book collecting. 20 years ago, you could have bought a pretty lovely copy of Origin of Species for about £25,000-30,000. Now, that’s going to cost you more than £200,000. So that book really has taken off in terms of its value. I could also point to things that have gone out of fashion. David Roberts, for example, who was an English artist of the Victorian era went to Egypt and did these amazing watercolours from his travels. And they were, essentially, the first pictorial images of the Arabic world. People would go out to these countries and think how fantastic it was and then want to own a copy of Roberts’ book. But in the last 15 years, no one is really going to Egypt and looking at the pyramids, so interest in the book has definitely come down. As an investment, it has been quite flat. Really, what you are looking for is where you think people will still be interested in this book in ten 10 years’ time. We have seen tremendous uplift in J.K. Rowling. It’s a classic. The fact is: Harry Potter and the Philosopher’s Stone (1997) came out 20 years ago. And, within two years of coming out, it was collectable—prices were going up. I know someone who purchased a copy of a Harry Potter book in the 90s and paid about £5,000 for it; they sold it at auction recently and it made £45,000. So these are the big rises. But why do we see a rise? Purely interest: the whole world loves Harry Potter and the interest just keeps on going with every movie that comes out. But here is the key thing—and this is where I think you can make a prediction—there is a trend that people tend to buy in later adulthood. So, let’s say in your 40s, when you have a bit more disposable income, people tend to buy books that they resonate with—books they’ve studied or read as a child. So, my generation, what do we have? We have Roald Dahl. And Roald Dahl has been going up. For people in their 30s, it’s Harry Potter. So when that generation gets older, into their 40s and 50s and 60s, they are going to continue to buy what they grew up and what resonates with them. So, you can look at trends at what people were studying and reading in the 80s and 90s and go from there. In the same way, we saw a huge rise in Catcher in the Rye, To Kill a Mockingbird and Lord of the Rings. The people who grew up maybe at university in the late 50s and 60s, these are what they read. Q. So it’s about trying to pre-empt what a given generation was inspired by growing up? PH: Yes, absolutely. And that is primarily where people start to collect: not because of an investment—that is usually secondary; people tend to buy a book because they really like it. So, if you buy something you really love as an investment, that’s fine, but buy the best you can afford. You want good condition; you want first edition; you want rarity and you want it inscribed. Q. If someone thinks they have a valuable book at home, what is the best thing to do with it? PH: When we look at condition, particularly with 20th and 21st-century books, the biggest damage is normally reading it—God forbid. You want unread copies, ideally. The colours on the cover are very sensitive to sunlight. So you should keep it away from direct sunlight and away from direct heat. In the shop, we have UV filters on our windows, for example. Light is definitely a destroyer of books. Everyone talks about fire—but the bigger damage is actually water. Water causes more damage to books than anything else. Q. How do people know when is the right time to sell their books? PH: It’s a fashion thing. Again, one thing that can definitely bring interest is when there is a movie coming out. We see it typically with James Bond. So every time a James Bond movie comes out, there tends to be an increase in interest leading up to the movie, rather than during the movie. And we saw it with the Narnia films. But beware: the movie better be good. If the movie’s not so good we can see the market soften. We saw that with [Philip] Pullman. Everyone was really jumping on the bandwagon. But actually the movie didn’t do very well and, as a result, the book interest dropped off too. Like any market, there can be little ups and downs. Q. So, based on that, is the rare and antique book market subject to the same ebb and flow as the art and financial markets? PH: I think it is different. It’s definitely a slower market. But I think that is changing. Traditionally, it has always been a steady growth. From that point of view, it is different. It is a smaller market. And it’s not quite as liquid as, say, coins or stamps. Literally, they act as monetary tools. You can’t do that with books. Q. It is quite unique, perhaps? PH: It is a little bit. It is a very niche thing. And the best advice I could give about buying books as an investment would be buy something you really, really love—that you think is utterly amazing, then the chances are someone else will think it is amazing, too, and you will be able to sell it. That is the key: just buy something really great, without faults. But it is also very important that you buy something that you really ‘get’. Q. What is the most exciting book you have ever handled? PH: We chase ‘Holy Grails’ of certain things. One of the best things we had was a first edition Frankenstein (1818) inscribed to Lord Byron from Mary Shelley—if one was looking for fantasy inscriptions of 19th-century literature, you would make that up and laugh. It was very funny because it was offered to us through email. I’ve also handled first edition Shakespeares and we’ve even done 13th-century manuscripts. Q. How strict are you with what you accept from people to sell in your shops? PH: Every book you see in this shop has been handpicked. We tend not to buy collections. Everything in the shop is handpicked and inspected and checked by one of our experts—usually me—and is then catalogued and photographed; it’s quite a rigorous process. Q. And is this process part of what sets you apart from other dealerships? PH: We are part of the ABA trade body and there is a certain standard there. So, yes, we do have high standards. Q. Is there a certain irony to the fact that you are selling copies of Das Kapital (Karl Marx, 1867) for hundreds of thousands, if not millions, or pounds? PH: There is a fantastic irony; it’s wonderful. The reason Das Kapital has leapt up in value recently is because of the market in China. The Chinese are buying this book as a sort of trophy piece. There is a huge exhibition in Beijing this year on Karl Marx it’s not that common a book either. You don’t need many wealthy Chinese people to want to have that book as a trophy piece to really move the market. The historic market for collecting Karl Marx rests with American and western economic collectors. But there is no question about it over the last 10 or 15 years, China and Hong Kong have been buying that book. And they study it. It is part of the history of China. Q. Can we put the likes of J.K. Rowling in the same category as James Joyce and Shakespeare, in terms of her collectability? PH: Yes, completely, she fills the criteria. James Joyce’s Ulysses was collected in his lifetime; the value of first editions of that novel went up within a year of publication. Ulysses was collected and moved on in price almost immediately, so it’s no different. And, if I wanted to make a bet: we like anniversaries. So we know 2022 will be the 100th anniversary of Ulysses and I think you will see an awful lot of exhibitions and interest in it. Q. And how about The Great Gatsby? PH: The Great Gatsby is the greatest ever American novel to some people. Again, it is like a trophy book to have a first edition. It is the most valuable of the American 20th-century literature books. And, as it goes, it also has the most striking dust jacket. Q. Does provenance play a role in this market in the same way it does in other art and collectables markets? PH: It does. And it’s probably a little bit more important than it used to be. Fortunately, in the book world, we have very little problems, relatively, with forgeries. It is very hard to fake a printed book. I wouldn’t say it’s impossible. But, if you know what you are doing, you can see the difference. Autographs, obviously, there are forgeries of autographs. We like to see a nice presentation inscription. Provenance can make a real difference. But it’s not like a painting. It’s not quite the same thing. The fact is: a book is not unique unless there are distinctive markings to it. Q. So inscriptions are important drivers of value? PH: It makes a massive difference. There are four different kinds of autographs. So, to give you an example, For Whom the Bell Tolls: a nice, first edition copy with a dust jacket is worth £1,000. If it was autographed by the author, then you would be looking at about £7,000. If it was inscribed to somebody, To Fred, best wishes, Ernest Hemingway, then you would be looking at probably £10,000-12,000. If it was inscribed to somebody you can relate to, let’s say his editor, then that is really quite good and you could get it up to £20,000-25,000. Then you have your real special ones: the best example of that is probably a dedication copy. A dedication copy of For Whom the Bell Tolls would be about £250,000. So the same book can command different values depending on these things. If you could find me a copy of For Whom the Bell Tolls inscribed to F. Scott Fitzgerald from Ernest Hemingway, I would probably give you half a million pounds for it. The big extremes we are seeing in pricing are with the great, the good and the ordinary. For something that really is magnificent, you get a much bigger leap in price. That differentiator would have been a lot smaller 20 years ago. Q. Have you ever come across books that claim to be what they are not? PH: Yeah, sure, there was a well-documented story about 13 years back. The great thing about printing books is that it uses movable type. And it is very difficult to reset moveable type. It’s like trying to get a thousand needles all in the same position at the same time. So people try to photocopy, but you don’t get the impression of printing. So you need that press. But someone very cleverly worked out that if you scanned a book, you could 3D print it to press. And they managed to do some early printed books and there were a few forgeries that went around. Because no one had seen it before, no one knew what to look for. And it took a couple of years for people to actually work out why there were a few too many copies of the same book going around. But now, people know what to look for and it’s fine. And actually, once you spot it, it is very easy to tell. So that was the first time there has been any kind of credible forgery. And that was with very sophisticated 15th-century books. It is almost a non-issue. Q. Do you find your customers are often buying for investment pieces, or just for personal collections? PH: I think it is a mixture of both. You can’t deny it: if someone is spending £20,000 on a book, it is an investment. I won’t be responsible for fashions, but I can stop somebody buying a bad copy of a book because, frankly, a bad copy of a book will always be a problem. Q. So do you think people actually keep these books on display or do they put them away in storage? PH: At the end of the day, they are there to be looked at. If you think about books like Charles Dickens novels, they have lived through the last 200 years in damp houses and they are here today and they have survived just fine. The biggest danger would be a burst water pipe that leaks into the library. Other than that, and direct sunlight, there should be no problems. We use acetate covers to protect the book from being torn. And we use custom-made book covers for our more expensive books. Q. What are the main signs that a rare book is valuable? PH: It has to have something about it; it has to be first edition. If it is autographed by the author or has a drawing in it by the illustrator, a first edition is not crucial but it would be nice. And then the condition—particularly if the book is common. Winnie-the-Pooh is a good example. They printed 25,000 copies of that book. As adorable and lovely as it is, that adored copy that has been read and drawn in by a child is just not going to be that valuable. The idea of collecting a rare book is that you are trying to collect it in the same condition as it would have initially been bought in. That means it has to be looking like new.